Some friends and I recently went "camping" at Virginia Beach. I guess you can't really call it camping since half of us brought our laptop, ipod, and coffee maker. We did, however, made it up by catching our own fish and cooking them in a "fire pit". 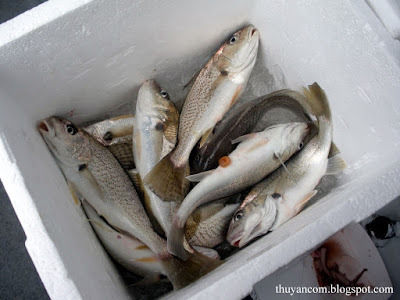 Between the five of us we managed to accumulate 23 croakers for dinner. The plan was for each of us to create a dish of our choice. We made a quick stop at a near by asian market to gather a few ingredients. 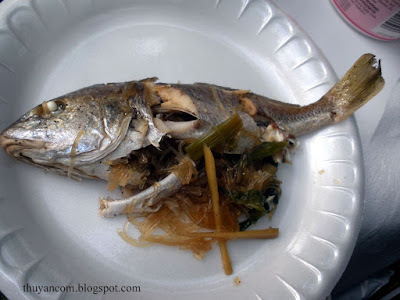 The first thing that came to my mind is steamed fish in soy sauce with ginger and green onions, commonly found at Chinese restaurant. After several hours of scaling and gutting our fishy, we finally got to play. 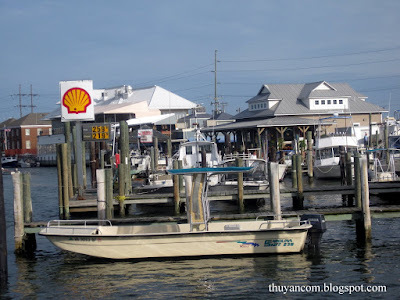 We eventually ate all 23 croakers and some even vow to not eat fish for a really long time. Overall it was a fun experience and you definitely could say we were roughing it! 1. Use the foil two make a steamer. Make two batch so it will steam more quickly. 2. Place 2-3 fish in enough foil to complete wrap around the fish. 3. Combine soy sauce and sugar and mix together until sugar is dissolved. 4. Stuff enough cellophane noodle in the belly of the fish. 5. Pour the soy sauce mixture on each fish. 6. Top off the fish with ginger and green onions, you can even stuff some in the belly of the fish. 7. 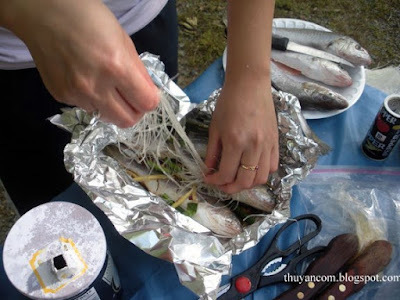 Place a few ice cube in the foil along with the fish (A neat trick I learned to help the fish stay moist). 8. 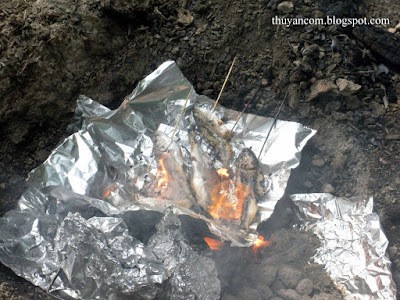 Wrap up the fish in the foil and throw in the oven (in this case the fire pit) for about 30-45 minutes.